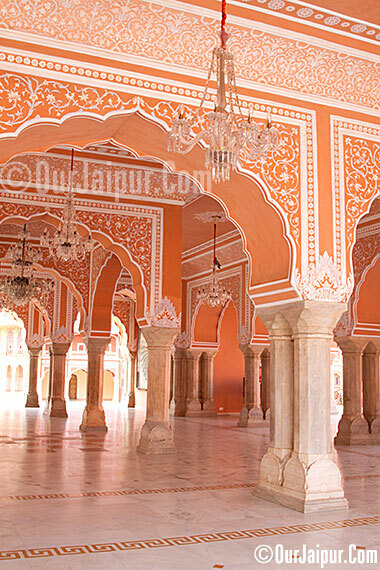 City Palace, Jaipur, which includes the Chandra Mahal and Mubarak Mahal palaces and other buildings, is a palace complex. 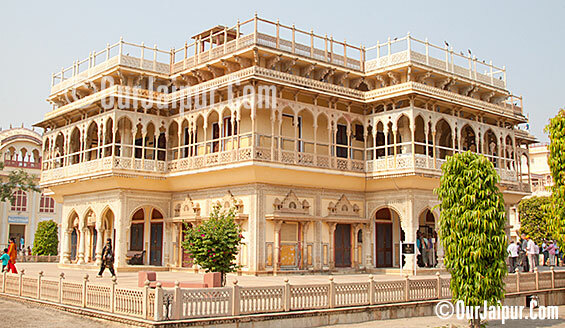 It was the seat of the Maharaja of Jaipur, the head of the Kachwaha Rajput clan. 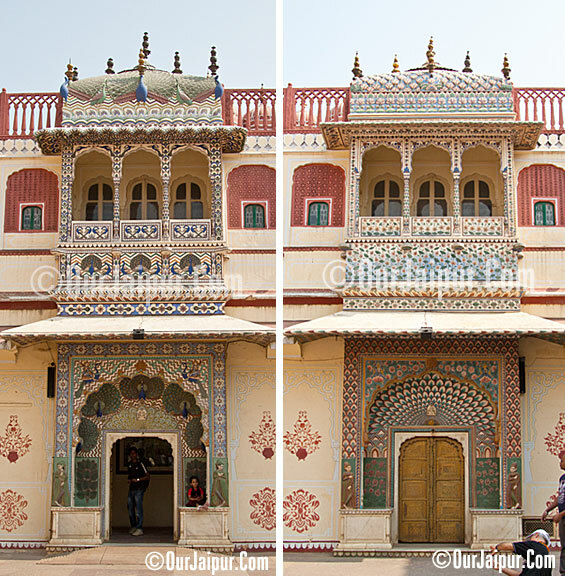 The Chandra Mahal palace now houses a museum but the greatest part of it is still a royal residence. 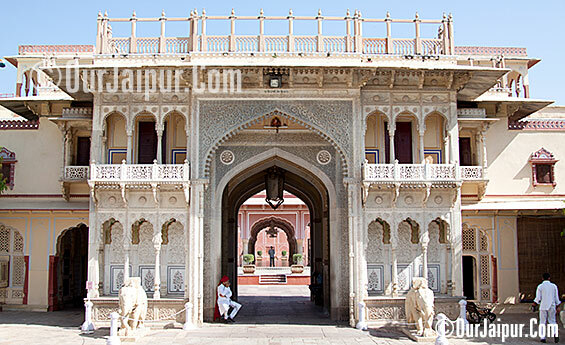 The palace complex, which is located northeast of the centre of the Jaipur city, incorporates an impressive and vast array of courtyards, gardens and buildings. 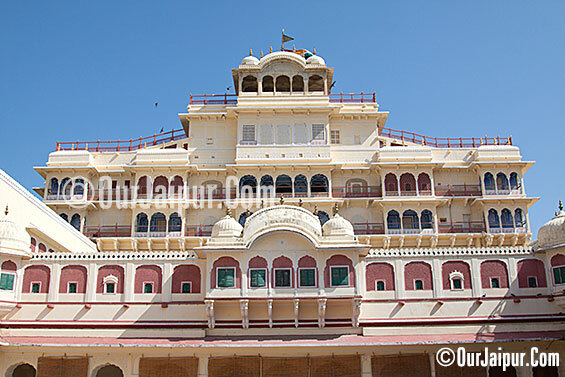 The palace was built between 1729 and 1732, initially by Sawai Jai Singh II, the ruler of Amber. He planned and built the outer walls, and later additions were made by successive rulers right up to the 20th century. The credit for the urban layout of the city and its structures is attributed to two architects namely, Vidyadar Bhattacharya, the chief architect in the royal court and Sir Samuel Swinton Jacob, apart from the Sawai himself who was a keen architectural enthusiast. The architects achieved a fusion of the Shilpa shastra of Indian architecture with Rajput, Mughal and European styles of architecture. One of The Entry Gates To The Palace Area. 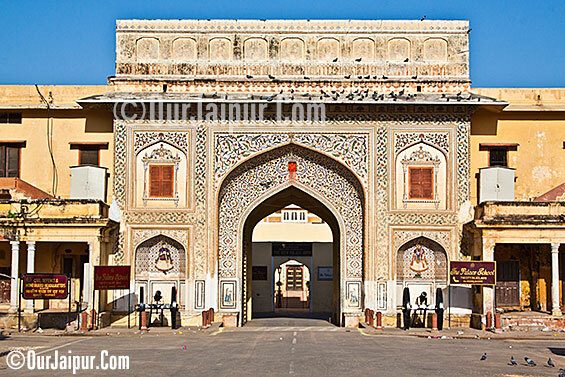 Virendra Pol, Udai Pol near Jaleb chowk and the Tripolia Gate (triple gate) are the entry gates to the City Palace. The Tripolia gate is reserved for entry into the palace by the royal family. Common people and visitors can enter the place complex only through the Virendra Pol and the Udai Pol or the Atish Pol (Stable Gate). The entry from Virendra Pol leads to the Mubarak Mahal. The gateways are richly decorated. 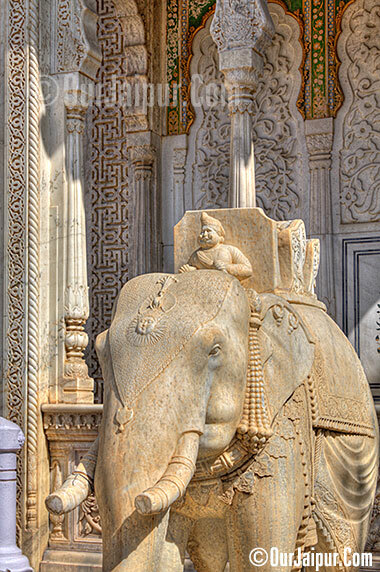 Beautiful Carvings and statue of Mahavat riding Elephant at the Gate. 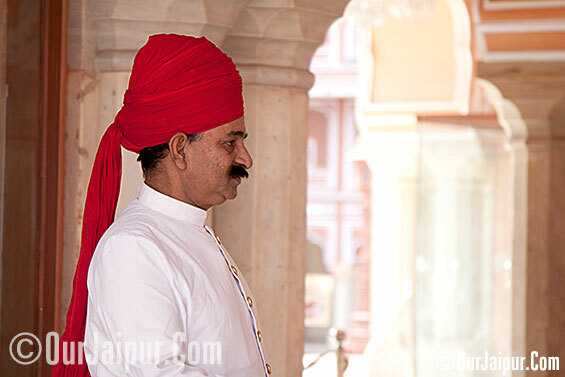 Mubarak Mahal, meaning the 'Auspicious Palace', was built with a fusion of the Islamic, Rajput and European architectural styles in the late 19th century by Maharaja Madho Singh II as reception centre. It is a museum; a fine repository of variety of textiles such as the royal formal costumes, sanganeri block prints, embroidered shawls, Kashmiri pashminas and silk saris as part of the Maharaja Sawai Man Singh II Museum. A noteworthy display here is of the set of voluminous clothes worn by Sawai Madhosingh I, who was 3.9 ft wide and weighed 250 kilograms but interestingly had 108 wives. Diwan-e-Khas was a private audience hall of the Maharajas, a marble floored chamber. It is located between the armoury and the art gallery. There are two huge sterling silver vessels of 5.2 ft height and each with capacity of 4000 litres and weighing 340 kilograms, on display here. They were made from 14000 melted silver coins without soldering. They are officially recorded by the Guinness Book of World Records as the world's largest sterling silver vessels. These vessels were specially made by Maharaja Sawai Madho Singh II, who was a highly pious Hindu, to carry the Ganga river water to drink on his trip to England in 1901 (for Edward VII's coronation) as he was finicky about committing religious sin by consuming the English water. Hence, the vessels are named as Gangajelies (Ganga water holding urns). There are a number of crystal chandeliers hanging from the ceiling. Two Sterling silver vessels of 5.2 ft height and weighing 340 kilograms. Crystal chandeliers and Beautiful Diwan e Khas. Pitam Niwas Chowk It is the inner courtyard, which provides access to the Chandra Mahal. Here, there are four small gates (known as Ridhi Sidhi Pol) that are adorned with themes representing the four seasons. The gates are the Peacock Gate (with motifs of peacocks on the doorway) representing autumn; the Lotus Gate (with continual flower and petal pattern) suggestive of summer season; the Green Gate, also called the Leheriya (meaning: "waves") gate, in green colour suggestive of spring, and lastly, the Rose Gate with repeated flower pattern representing winter season. Chandra Mahal Clicked From Pitam Niwas Chowk. 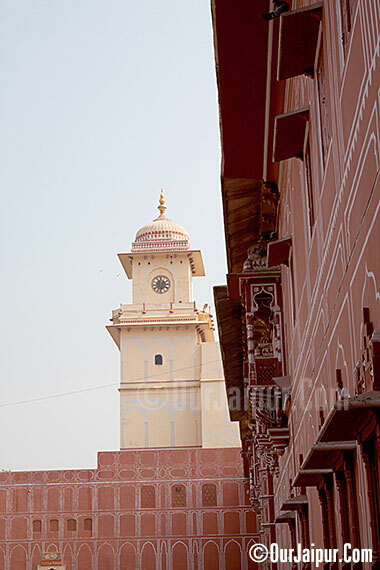 Chandra Mahal or Chandra Niwas is the most commanding building in the City Palace complex, on its west end. It is a seven-storeyed building and each floor has been given a specific name such as the Sukh-Niwas, Ranga-Mandir, Pitam-Niwas, Chabi-Niwas, Shri-Niwas and Mukut-Mandir or Mukut Mahal. It contains many unique paintings, mirror work on walls and floral decorations. 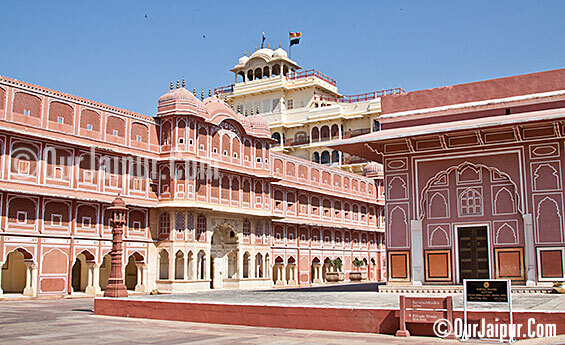 At present, most of this palace is the residence of the descendents of the former rulers of Jaipur. Only the ground floor is allowed for visitors where a museum is located that displays carpets, manuscripts and other items that belonged to the royal family. There is beautiful peacock gate at the entry to the Mahal. It has screened balconies and a pavilion at the roof from where a panoramic view of the city can be seen. It is set amidst well laid out gardens and a decorative lake in the foreground. Also seen at the top of the Chandra Mahal is the flag of the royal family, which is seen unfurled when the Maharaja is in the palace. It is a one and quarter sized flag. However, when the king is away, the queen's flag is hoisted on the building. Peacock Gate (with motifs of peacocks on the doorway) representing autumn. 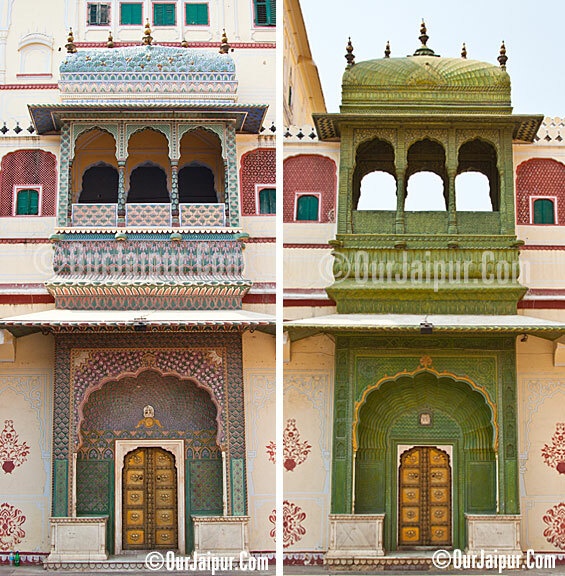 Two of the Four Famous Gates of City Palace, Jaipur. Peacock Gate & Lotus Gate. 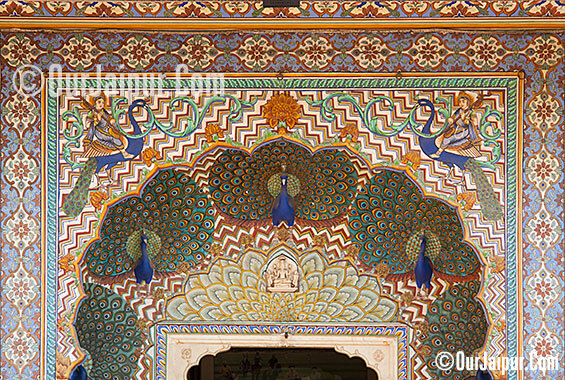 Two of the Four Famous Gates of City Palace, Jaipur. Rose Gate & Leheriya Gate. Entry Gate to The Palace Café. 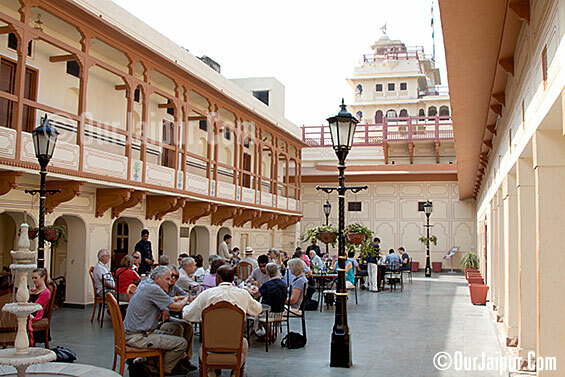 The Palace Cafe is situated inside the inner courtyard of the City Palace, and you will come across it at almost towards the end of your city palace sight-seeing. There is outdoor & Indoor sitting Depends upon Your mood and Season That where will you want to sit and what do you want to have Quick Bite or proper Lunch. There are No charges for looking but keep in mind it's bit Expensive. 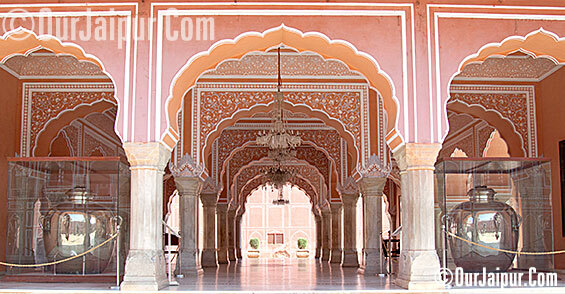 On The Whole This is a Must See Place If you are in Jaipur You have to Visit City Palace. Highly Highly Recommended. 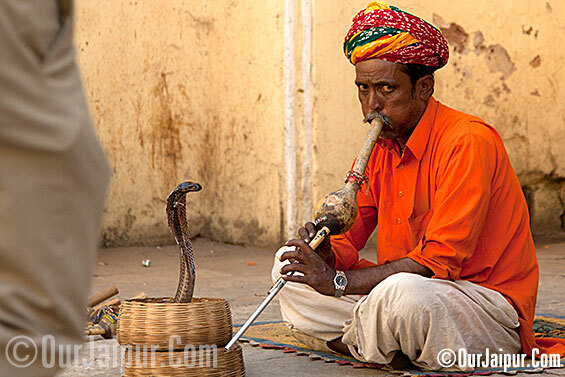 Snake Charmer at the Exit point of City Palace Jaipur. 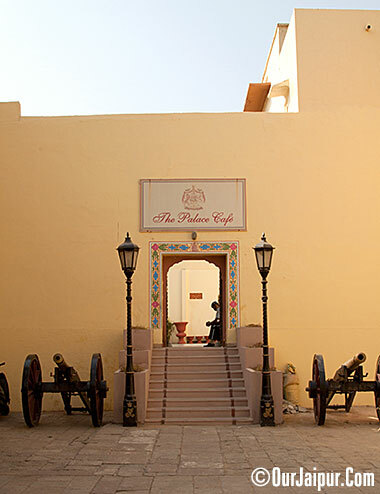 Atish Pol (Stable Gate) Is also being used for Entry and Exit From City Palace Compound Jaipur. Nice write with a whale of info and pictures. Lovely pictures and I love the place as well. Seriously, that place is amazing. I've never been in that country but I have always admired their designs and architecture. thank you so much for your comment! I'm following you! please follow me back! Such a lovely place!!! Amazing pics!! Wow! The palace is beautiful! Love your blog! Amazing photos and great blog! amazing !! Spell bound !! Just fabulous !! Am planning a tour to Jaipur in later part of the year. Done with following and please do the same. You have a wonderful blog, very nice write up. I am planning to visit Rajasthan after I come back to India. Your post is going to be really useful. Awesome pics and lovely post. Thanks for visiting my blog and commenting. Am happily following you and please do the same. Thank to follow me, I'm following u too now! Quite an appealing and informative blog you've here...great job!!! lovely write ups n happy to follow u.
Hello dear, thank you for stopping by! I'm so fascinated by your blog, by your city, and of course I'm glad to follow you via Bloglovin, Gfc, g+ and Facebook (private I'd Valeria Arizzi). Hope you'll stop by again and return the love! P.s. have you checked out my post "ootd - satin"? It was inspired by your charming culture. Thank you for the comment on my blog hun! I am following you now! Can you double check that you are following me too? Wow, that's a gret post, I made a virtual trip into this magic place and it was awesome! I really fell in love with this place! amazing place :) C, xoxo. thanx for visiting, shall we follow? I would love to see this amazing architecture in person! Such a magnificent place! It makes me think about the things we have still to discover! I was there in November 2012just for Diwali . never in my life I' forget those moments I've spent there . Just working hard and sparing money to come back ! If you go back in my older post you'll find "Indian post "
Following you with GFC! . Keep up the good work and stay in touch ! Thanks for your visiting, I Follow you! wow... what a lovely place!! It all looks so magnificent! WOW! Never been Jaipur, but heard a lot and seen a lot of travel programs in TLC about this city!! Nice write up and wonderful clicks! Thnak U PavithraJi, Come once to Jaipur I am sure you will enjoy a lot. Your blog is really interesting, what do you think about following each other? Trust me when I say this,even before opening this link I had this assumption of your blog being amazing,and yes it turned out to be a definite so! I love the pictures,and since they're all being captured in day,adds more cheerfulness. Jaipur is one beautiful place to visit! I always find it soothing when I could relive my reminiscences through your blog!! Amazing palace my favorite so far the detail of the building so beautiful cool it has a Cafe. Thanks for sharing. Thanks for visiting...and I'm following you on gfc and google+, hope you do the same! I love the architecture - so beautiful and colorful. Major inspiration abound here! What a beautiful palace and a beautiful city! Such incredible craftsmanship! Thanks a bunch for following! I'm now following you on GFC (Juneli#116)! hope you will follow me soon..!! Wonderful places, we'd like to go.. really nice pics! !